Slots Ahoy Classic Slot Guide & Review - Casino Answers! Slots Ahoy is a 3-reel, 1-line classic slot machine developed by Random Logic, featuring a wild symbol and scatter wins. 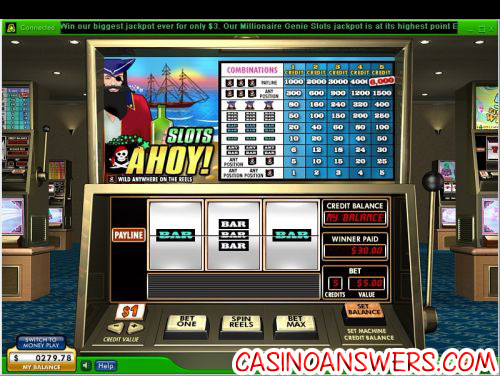 You can play the Slots Ahoy Pirate slot machine at Reef Club Casino and Supro Casino. Bets on the Slots Ahoy casino game are $0.25, $0.50, $1 and $2. There aren’t very many coin sizes available due to the fact that is a 5-coin slot machine. You can bet as little as a quarter per spin on Slots Ahoy or you can bet as much as $10 per spin. Slots Ahoy is a great classic slot for casual and low stakes casino players. To play Slots Ahoy, choose your coin value, hit “Bet One” once for each coin you wish to play and then hit “Spin Reels.” Or, if you want to play all 5 coins, hit the “Bet Max” button to spin the reels. The highest paying symbol in the Slots Ahoy slot machine is the Pirate Flag symbol. If you hit 3 Pirate Flag symbols on the payline, you will win the 6000 coin top jackpot. The Pirate Flag symbol is essentially a scatter symbol, as it will also pay out (to a lesser degree) off of the payline. 3 symbols outside of the payline will pay out 1500 coins. The Flag symbol is wild and will substitute for any other symbol in Slots Ahoy. The Pirate Flag symbol is by far the most desired symbol you can get when playing Slots Ahoy at Reef Club Casino. There are 9 winning combinations on the Slots Ahoy classic slot game. The full payout schedule is as follows (1/2/3/4/5 coin payouts in parenthesis): 1 Pirate Flag symbol in any position (1/2/3/4/5), 2 Pirate Flag symbols in any position (5/10/15/20/25), any 3 Bar symbols (6/12/18/24/30), 3 Single Bar symbols (10/20/30/40/50), 3 Double Bar symbols (20/40/60/80/100), 3 Triple Bar symbols (50/100/150/240/250), 3 Captain symbols (80/160/240/320/400), 3 Pirate Flag symbols in any position (300/600/900/1200/1500) and 3 Pirate Flag symbols on the payline (1000/2000/3000/4000/6000). Slots Ahoy is a great pirate slot for casual players that won’t cost them a lot of money and gives them to chance to win some treasure. The ability to get a winning combination off of the payline is also very much welcome, as we can’t tell you how many times we were one symbol away from a huge win on a classic slot. To play Slots Ahoy, sign up and make your deposit now at Reef Club Casino! If I’m in the United States, can I play Slots Ahoy for real money? Unfortunately, American players are out of luck when it comes to playing the Slots Ahoy pirate slot for real money. Luckily, you can still play several other pirate slot games, including Pirate Slots at Bodog Casino.